It's so great to see one of the best-loved British classic Ealing comedy films from the 1950s enjoying a resurgence in popularity, brought back to life with the fantastic Stephen Mangan at the helm in the starring role. It's all thanks to Sean Foley, the adapter and director, and it's on at the Wyndham's theatre from early October 2019. A comedy treat with a difference, it really is a laugh a minute. The story? When Sidney Stratton, played by Stephen Mangan, invents a material that never wears out and repels dirt magically, he's thrilled... and a fast-paced comedy ensues. It's a world-changing invention. But there's a huge down side. Fabric manufacturers, trade unions and workers at grass roots level are all petrified by the discovery, which threatens their jobs and puts the entire industry in danger. Only one person sees the potential of the magical fabric in the same way as Stratton, and that's the delightful Daphne, the mill owner's daughter, played by Kara Tointon. She's on Stratton's side, supporting him as the bosses and workers chase him around the streets, infuriated by his pure white suit that always looks absolutely spotless. Stephen Mangan and Sean Foley previously worked together on the Olivier award-winning production Jeeves and Wooster, so it's a long-awaited reunion guaranteed to deliver loads of giggles. Mangan has also thrilled audiences in The Birthday Party, The Norman Conquests – which nabbed him a Tony nomination – and the BBC's comedy Episodes. Oh, and don't forget the comedy to end all TV comedies, the dazzlingly hilarious Green Wing. Sean Foley has recently made a splash with The Dresser, The Miser, and The Painkiller. He has won two Oliviers and is the next Artistic Director of the Birmingham Rep. And he's no stranger to Ealing comedies either, having also staged The Ladykillers. 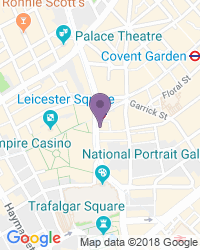 Kara Tointon is known and loved for roles in Twelfth Night for the RSC, Alan Ayckbourn’s Relatively Speaking and Absent Friends, and as Eliza in Pygmalion. This comedy has a serious message to share. It might be funny, and silly, and entertaining. But it also examines what happens when people who are usually enemies join forces to try and stop progress. It's about the establishment resisting change, about the way fantastic new inventions get suppressed because those in charge profit from the status quo. A sophisticated farce, this play is jam packed with slapstick and fun. The score is rich in skiffle music, perfect for the setting. And it's on at the gorgeous Wyndham's theatre following a three week run at the Theatre Royal Bath. This play is great fun, a rip-roaring comedy adventure that's perfect for people aged 10 and above. 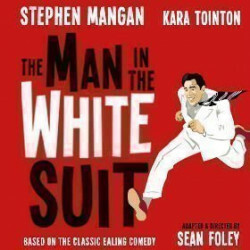 Use the search box at the top left of this page to search for The Man In The White Suit tickets availability.